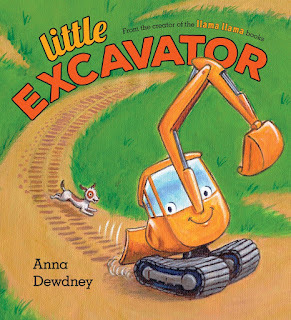 Guys, I am super excited to be a part of the blog tour for Anna Dewdney's new book, Little Excavator. I'm pretty sure this made me a bit of a celebrity in my little boys' eyes. Obviously, we love all things that go in my house, especially anything dealing with construction, so this book was right up our alley. Plus, we absolutely love the late, great Anna Dewdney, known for her Llama Llama series; she will always hold a special place in our hearts. Here's a little about Little Excavator, which publication date is June 6th; just in time for summer reading! What could possibly be as appealing as Anna Dewdney's llamas? Anna Dewdney's trucks! The Big Rigs are working hard at the construction site when Little Excavator rolls up, eager to help. But Little Excavator isn't big enough to CHUG CHUG CHUG! like the Dump Truck as it loads dirt to lug or MOUND MOUND MOUND! like the 'Dozer as it pushes up the ground. Little Excavator wants to smooth out bumps and dig up dirt, but he is just too small. As Big Rigs around him WORK WORK WORK! they finally find a job that no other machine can do...except for Little Excavator! 1. He's so darn cute - I love the character of Little E. He knows he is a bit too small to do the big jobs, but that doesn't stop him from trying. I love his determined attitude! 2. Perfect for a read aloud - The rhyming text and Dewdney's use of onomatopoeia make this picture book a perfect read loud for little ones as well as preschoolers. Both of my boys really enjoyed reading this with me as well as the fun sound effects. Summer is the perfect time to read more with your child and this book is a great place to start. 3. The message - I love the message of Little Excavator and it sparked an important discussion in our house. Essentially, it reminds little ones that even if you are too small to do "some big jobs" there are important little jobs that you can do to help out. This is so true when raising overly eager toddlers that want to do everything on their own. 4. The Illustrations - Dewdney hit it out of the park with this one. I love the cheery look of Little E and the other construction vehicles are just as vibrant. It inspired a whole afternoon of playing with our construction vehicles. 5. It's A Great Addition - My boys have many books all about various types of vehicles, but Little Excavator definitely deserves a spot on our bookshelves. If you a child that enjoyed Goodnight, Goodnight Construction Site, definitely give Little Excavator a try this summer. I think children will fall in love with Little E just as much as we did. 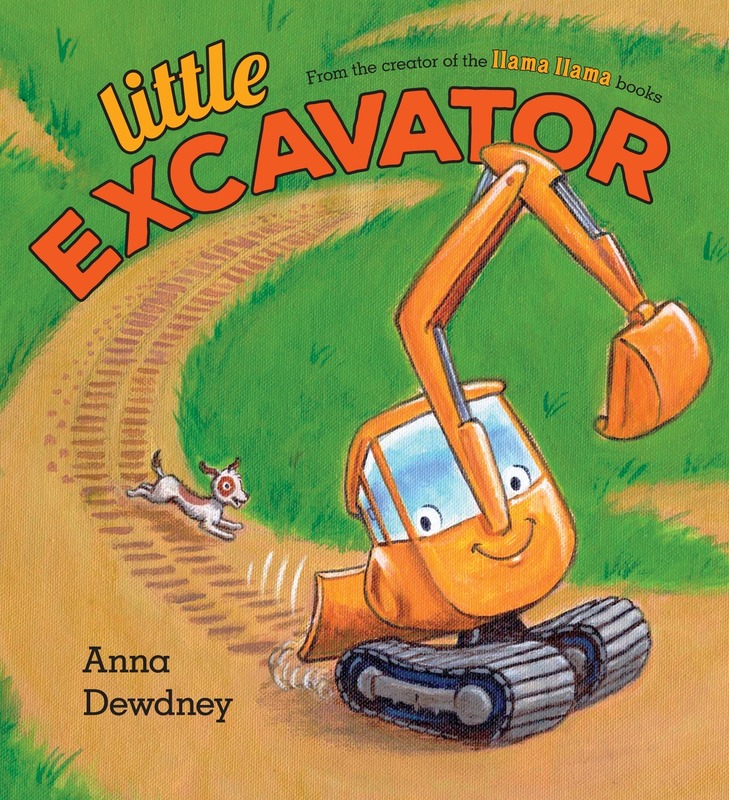 You can pre-order Little Excavator here and learn more about this new book as well as Dewdney other picture books. Also, a big thank you to Penguin Young Readers for allowing me to host a giveaway for five copies of Little Excavator. How fabulous is that? Please refer to my giveaway rules. The giveaway is open till June 19th and it's for US residents only. Good luck! Me too, Joy! We loved checking it out. Thanks for visiting! It's super cute! I hope you get your hands on a copy. Thanks for visiting, Susan! It's a really cute read. My sons love construction trucks too, so this was hit. Thanks for visiting, Mandy. How adorable bid little E. My grandsons would love this. Thanks for your post. I bet they would! Thanks for visiting, Carol! My guys love trucks and construction vehicles. They would love to read this book! Me too, Susan. I hope you can check it out with your boys this summer. Thanks for visiting. My Grandson loves trucks and equipment. I got him an Excavator for his birthday and he would love this book like he likes his equipment. Aww! Then this would be the perfect book to go along with his excavator! Thanks for visiting, Karen!